Skaftafell, the second national park recognized in 1968 comprises of some of the most amazing natural pearls of the country. The rugged landscapes, mountains and glaciers, the flora and the fauna have a charming influence on the tourists. Skaftafell National Park is one of those destinations in Iceland which should not be missed. It has a beautiful mountainous region towards the south of Iceland on the southern edge of the mighty Vatnajokull glacier.The old Skaftafell National park is around 5,000 km2 but from 2008 the epicentre of the largest National Park in Europe; Vatnajokull National Park covers 12,000 km2. This area is an appealing place to view the amazing contrasts between active volcanoes, enormous glaciers, powerful glacier rivers with endless flat sandy plains and the park seems to be the birth place of Icelandic Mountain Guides. This is where the glacier tours began in 1994, enabling tourist to enjoy nature of the park in a safe, enjoyable and friendly environment. Several options are there to enjoy the experience of this amazing destination. One could hike from the campsite or the hotel or drive to the glacier lagoon, hike up to the Kristinartindar peaks for a beautiful view, watch the documentary of the 1996 eruption in the Skaftafell Visitor Centre and much more. 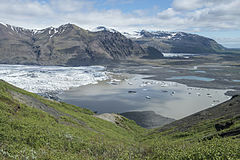 The Skaftafell Visitor Centre is said to be an information as well as service centre wherein visitors could get answers to their queries regarding Skaftafell together with information regarding hiking tracks, accommodation and recreational option in the area. The centre also tends to have an exhibitions room where the story of fire and ice is narrated, the way the volcanoes and glaciers struggled to form the surrounding area as well as the effects of the eruptions together with the glacial outburst floods of daily life of the people. Put up on display are the items from the fateful expedition of British students in 1952 together with a film of the southern territory of Vatnajokull National Park. Tourist preferring to experience glacier walks or indulge in some mountain climbing, could seek the help of the local expert mountain guides. There are three various glacier walks on the Svinafellsjokull Glacier with a day tours/ice climbing for all levels. On the high mountains surrounding the park, mountain climbing is done up to the high glaciated mountains of Hrutsfjallstindar and the highest summit of Iceland – Hvannadalshnukur. The combination of scenic landscape together with favourable weather condition and a selection of hiking trails have made Skaftafell one of the most ideal locations for tourists preferring the outdoor activities in Icelandic atmosphere. Easy and short tracks tend to lead to waterfall Svartifoss and glacier Skaftafellsjokull. However for those needing to go further on, the Morsardalur valley and Kristinartindar mountain peaks seems to be ideal with regards to labour and distance. Skaftfell also seems to be the appropriate base camp for those intend on climbing Iceland’s highest mountain peak – Hvannadalshnjukur. Skaftafell also has private travel companies operating and provide guided hikes to the nearby mountains and glaciers as well as sightseeing flights over glacier Vatnajokull together with other famous attractions.